Doctor copper has a long history as a bellwether commodity when it comes to the health and wellbeing of the global economy. We can debate the efficiency of the copper price as a leading indicator, but recently the red metal has been watching and reacting to the ongoing negotiations between the United States and China over trade. Chinese when it comes to US goods. With the 2020 election season gearing up, President Trump wants to deliver on his promise to level the playing field when it comes to trade with the Chinese. A victory would be a political bonus as he hits the campaign trail in his re-election bid. The copper market has been telling us that success is on the horizon as the price of the red metal has been moving towards the $3 per pound level after trading to a low at under $2.55 at the start of 2019. BHP Group (BBL) is based in Melbourne, Australia, but the company’s tentacles reach around the globe. BHP is one of the leading natural resources firms in the world and a leading producer of copper as it operates the largest copper mine in Chile and properties around the globe that produce the red metal. 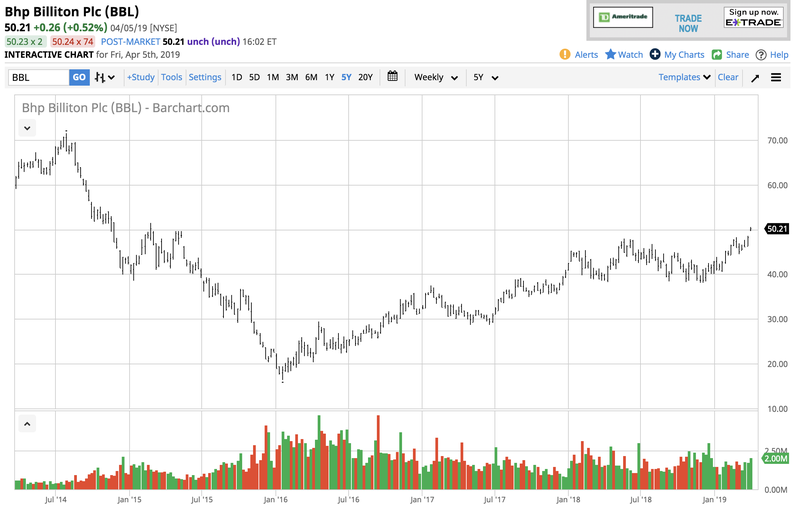 A rise in the price of copper above the $3 level would support gains in the price of BBL shares. Copper came into 2019 with a whimper as the price dropped to a low at $2.5430 per pound on January 3, the second day of trading of the year. Since then, the price of copper has recovered and traded at the highest level since June 2018 when it was on its way lower on the back of the trade dispute between the US and China. On the way down, copper broke below multiple levels of technical support, the last being at $2.8750 which was the September 2017 low. In February, the price rose above that level. As the weekly chart highlights, the price of copper rallied steadily from the early January low through the end of February when the price ran out of steam on the upside at $2.9780 on the nearby COMEX futures contract. After a correction that took copper back to $2.8335 in March, the price moved to a marginally higher high at $2.9885 on April 1. The price of the base metal was trading just below the $2.90 per pound level at the end of last week with price momentum in slightly overbought territory and relative strength at the upper region of a neutral condition. Open interest has been flatlining around the 250,000-contract level since early February as copper has been following the ups and downs of the flow of trade negotiations between the US and China. At around $2.90 per pound, the copper market remains optimistic that a trade deal is on the horizon. In March 2018, copper inventories on the London Metals Exchange moved to a high at over 388,000 metric tons. In mid-March 2019, the stockpiles in LME warehouses had declined to a low at 111,775 tons, a drop of over 71%. 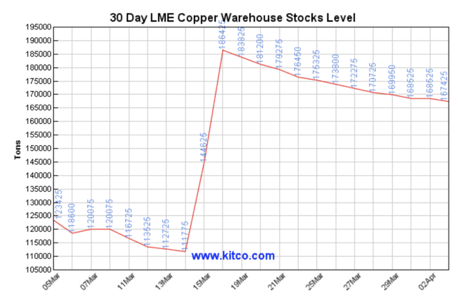 As the chart shows, LME stocks suddenly increased in mid-March to 186,425 tons from the low which likely put some downside pressure on the price of copper which fell to $2.8335 during the week of March 25. However, stocks had been edging lower since the recent high and stood at 167,425 tons as of April 2. On April 4, they rose to 198,325 tons which put some pressure on the price of the red metal at the end of last week. 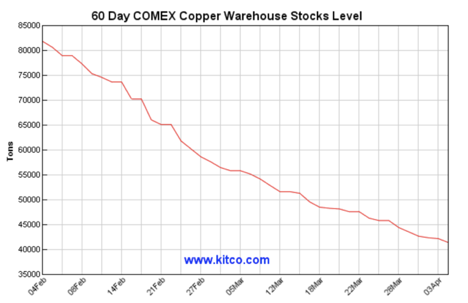 Meanwhile, stocks of copper in COMEX warehouses moved lower over the past two months. As the chart shows, COMEX inventories declined from around 82,000 tons to 41,425 tons as of April 4. Overall, the current level of copper stockpiles on the two leading exchanges in the world is supportive of the price of the red metal. Declining stocks is a sign of robust demand for the red metal. I will be keeping an eye on the LME stocks next week. If they rise above the 200,000-ton level, we could see further corrective price action. China by the US and Chinese retaliation caused the price to fall like a stone. To just over the $2.50 per pound level in August 2018. As the monthly chart shows, the price spent around four months consolidating between just over $2.50 and under the $2.8750 technical resistance level when price momentum declined into an oversold condition. Rising optimism over a new framework for trade between the US and China lifted the price of copper over its technical resistance price at $2.8750 and pushed the price to just shy of $3 per pound and price momentum crossed to the upside on the longer-term chart and is now in neutral territory. The trade dispute has weighed on China’s economy, but economic growth in the world’s most populous nation was still at over 6.5% in 2018. China continues to grow, and that means that the demand for infrastructure building across the country of 1.4 billion people is rising. At the same time, President Xi rolled out a program to reduce pollution near many Chinese cities which caused a reduction in the smelting and refining of metals. Cutting pollution in China means that import requirements for refined copper are likely rising. A trade deal could propel demand for the red metal even higher over the coming months which is a reason why copper traded to a high at almost $3 per pound. The monthly chart indicates that the current path of least resistance for the price of copper is higher. A trade agreement between Presidents Trump and Xi could send the price back over the $3 per pound psychological level in copper and set the stage for a higher peak above the $3.3220 resistance level. On April 4, President Trump expressed optimism over a trade deal. He told markets that negotiators need another four weeks to settle the many issues but added that the two sides had already agreed on many of the most challenging factors. Intellectual property and the future of tariffs continue to be sticking points for a final deal. Therefore, we are likely to see a continuation of volatility in the copper market over the coming month with support at over $2.80 and resistance at the $3 per pound level on the nearby COMEX futures contract. BHP Group has net assets of $204.997 billion, trades at a price to earnings multiple of 24.53 times earnings and pays a dividend of 4.41%. Over 1.5 million BBL shares change hands on average each day. As the chart shows, BBL shares are correlated with the price of copper which is one of the leading products for the company. BBL has rallied steadily since early 2016 when copper fell to a low at $1.9355 per pound. Last May the shares traded at a peak at $47.92, but the issues at Escondida and the weak stock market in Q4 2018 caused a correction to a low at $38.04 in late 2018. Since then, the shares have been moving higher reaching their most recent peak at $50.59 per share last week and they closed at over the $50 level. There is an excellent description of the difference between BBL and BHP shares via this link. The piece opines that “It is almost always better for Americans investing through retirement accounts to buy into BBL rather than BHP. As a significant producer of copper, both BBL and BHP are likely to move higher or lower with the price of the red metal over the coming weeks. As a barometer of the state of trade negotiations between the US and China, the company is likely to act as an excellent proxy for the price of the red metal which could move back above $3 per pound in the event of a trade agreement that ends the current era of protectionism. Welcome to the March review of DivGro, my portfolio of dividend growth stocks. 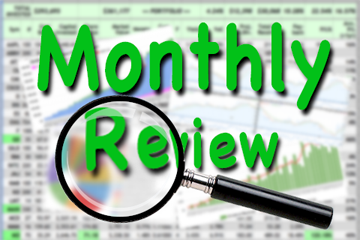 Quarter-ending months are exciting, as many of the stocks I own pay dividends in these months and I usually set a new record for monthly dividend income in quarter-ending months. March did not disappoint. I received dividends totaling $3,220 from 43 stocks in my portfolio, a new record for monthly dividend income! Year over year, DivGro’s dividend income increased by 28%. So far in 2019, I’ve collected $6,724 in dividends or about 27% of my 2019 goal of $25,200. Looking at how the month’s activities impacted DivGro’s projected annual dividend income (PADI), I note that five DivGro stocks announced dividend increases in March. Additionally, I opened one new position and added shares to five existing positions. On the other hand, I closed out one high-yielding position. Unfortunately, the net result of these changes is that projected annual dividend income (PADI) decreased by about 0.6% in March. Year over year, PADI increased by 39%. DivGro’s PADI now stands at $25,376, which means I can expect to receive $2,115 in dividend income per month, on average, in perpetuity, assuming the status quo is maintained. Of course, I expect the companies I’ve invested in not only to continue to pay dividends but to also increase them over time. Also, until I retire, I hope to continue reinvesting all dividends, so DivGro’s PADI should continue to grow through dividend growth and through compounding. While it would be nicer if dividends were distributed more evenly, it is not something that would drive my investment decisions. These changes will increase DivGro’s PADI by about $39. I like seeing dividend increases above 7% and three of the five increases top my expectations. As for the REITs O and WPC, they announce dividend increases multiple times per year. O’s year-over-year increase is 2.96%, whereas WPC’s year-over-year increase is 1.67%. After opening a small position in Chevron (CVX) in December 2018, MRK was the highest ranked stock in the top 50 holdings of dividend ETFs not in my DivGro portfolio. MRK ranked higher on an aggregate score than several of my Health Care sector holdings and, according to Simply Safe Dividends, MRK has a Very Safe dividend safety score of 98. I opened a relatively small position of 30 shares at $80.52 per share, as MRK is not trading at my preferred discount to fair value of at least 10%. With this opening position, I’ll be able to track MRK more closely and look for opportunities to add shares at a better valuation. I decided to close my position in OHI on concerns about the declining fundamentals of OHI’s skilled nursing tenants. OHI has a Borderline Safe dividend safety score of 47, yet the REIT’s yield of 7%+ provides some compensation for the increased risk. Unfortunately, OHI broke a streak of 21 consecutive quarters of dividend increases when it froze its dividend last April, and unless OHI declares another dividend increase in 2019, it will be removed from the CCC list of dividend growth stocks. It turns out my closing trade was about two weeks premature, as OHI closed at a 30-day high of $38.31 on 28 March. Nevertheless, my closing price of $35.90 secured a net gain of 29% or about 18% annualized. To (somewhat) make up for the $660 in annual dividends I gave up by closing my OHI position, I added shares to several existing positions trading at favorable comparative yields. CVS continues to struggle and now is trading about 34% below its 52-week high. I paid $53.49 per share and lowered my average cost basis to $65.16. CVS froze its dividend after buying Aetna, though Simply Safe Dividends still considers the dividend Safe with a dividend safety score of 75. HD‘s dividend safety score is 90 (Very Safe) while the stock’s current dividend yield of 2.71% is 29% above its 5-year average of 2.11%, according to Simply Safe Dividends. I paid $182.11 per share, slightly lowering my average cost basis in the process. The stock’s dividend growth is stellar, with 5-year and 20-year dividend growth rates of 22%. I also added 10 shares to my HON position, which is deemed a Very Safe dividend growth stock with a dividend safety score of 98. HON is trading at about fair value. Honeywell reported solid Q4’18 results and the management team increased their guidance for fiscal 2019. I think the stock is a great long term hold, though it is vulnerable to market cyclicality. IRM‘s dividend yield of 6.8% is about 11% above its 5-year average dividend yield of 6.13%. 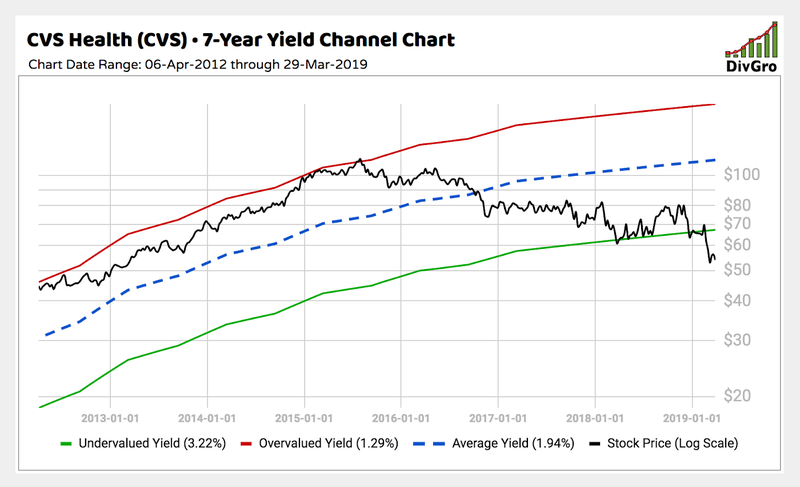 While the REIT’s dividend safety score is on the low end at 52 (Borderline Safe), I think the 6.8% yield compensates me sufficiently for the somewhat higher risk. I paid $34.86 per share and I notice the stock is now trading above $36 per share, so my timing seemed to be good. Finally, it is not often that one can buy MMM at a discount to fair value. I missed an even better opportunity in December 2018, but I’m happy that I grabbed 15 shares at $206.08 in March. The stock now trades at $216 per share. MMM has a Very Safe dividend safety score of 86 and boasts a 5-year dividend growth rate of 16%. The net effect of my March transactions is that DivGro’s PADI decreased by about $198. However, I believe my portfolio’s risk profile has improved in the process and I’m happy that I replaced the somewhat riskier OHI with safer alternatives. In March, the DOW 30 increased slightly, the S&P 500 increased by 1.79%, and the NASDAQ increased by 2.61%. The yield on the benchmark 10-year Treasury note fell to 2.414%, while CBOE’s measure of market volatility, the VIX, decreased to 13.71. Based on the total capital invested and the portfolio’s current market value, DivGro has delivered a simple return of about 47% since inception. In comparison, DivGro’s IRR (internal rate of return) is 14.5%. (IRR takes into account the timing and size of deposits since inception, so it is a better measure of portfolio performance). I track the yield on cost (YoC) for individual stocks, as well as an average YoC for my portfolio. DivGro’s average YoC decreased from 3.98% last month to 3.92% this month. On the other hand, DivGro’s projected annual yield is 4.73%. This is down from last month’s value of 4.84%. I calculate the projected annual yield by dividing PADI ($25,376) by the total amount invested. Percentage payback relates dividend income to the amount of capital invested. DivGro’s average percentage payback is 13.5%, up from last month’s 13.1%. I’ve been working on creating a database of weekly dividend yields covering a period of 12 years. For now, the database covers dividend-paying stocks in my portfolio. In time, I’d like to add high-quality dividend growth stocks I don’t yet own. 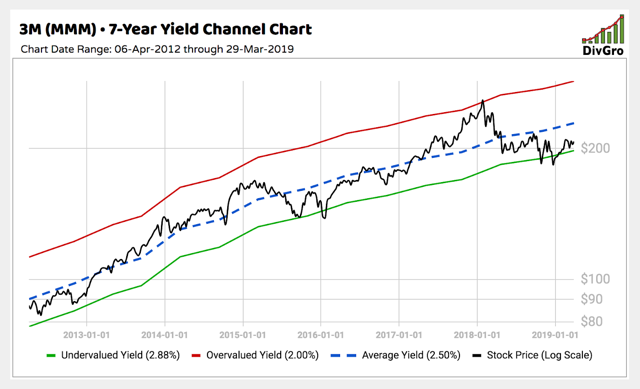 Maintaining the database will allow me to create yield channel charts at any time to help guide investment decisions. 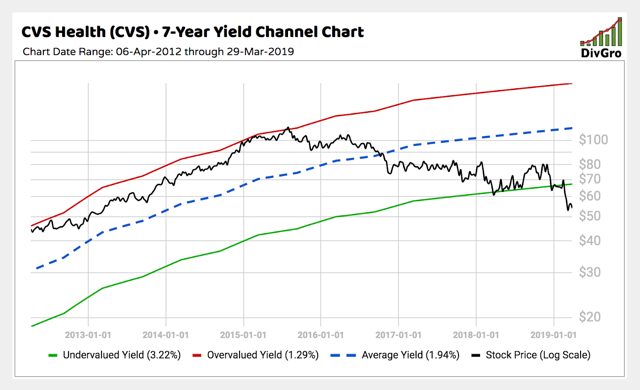 Furthermore, I’ll be able to do a quick fair value estimate for stocks in the database by comparing the current dividend yield with the historical average dividend yield over a period of, say, five years. I’m hoping to get back to writing monthly DivGro Pulse articles and share yield channel charts of stocks trading at or near extreme historical yields. Please see my Performance page for various visuals summarizing DivGro’s performance. Thanks for reading and take care, everybody! Disclosure: I am/we are long AAPL, ABBV, ADM, AFL, AMGN, APD, AVGO, BA, BLK, CB, CMCSA, CMI, CSCO, CVS, CVX, D, DGX, DIS, DLR, EPR, ES, EXR, FDX, FRT, GD, HD, HON, HRL, IBM, INTC, IP, IRM, ITW, JNJ, JPM, KO, LMT, LOW, MAIN, MCD, MDT, MMM, MO, MRK, MSFT, NEE, NNN, O, PEP, PFE, PG, PM, ROST, RTN, SBUX, SKT, SPG, SWK, T, TJX, TROW, TRV, TXN, UNH, UNP, UPS, V, VLO, VZ, WBA, WEC, WPC, XOM. I wrote this article myself, and it expresses my own opinions. I am not receiving compensation for it. I have no business relationship with any company whose stock is mentioned in this article. Technology has long infused health care with inspiration and hope. The trend held true on Wednesday when a trio of forward-thinking industry leaders shared their thoughts on the future of medicine at Fortune’s fourth-annual Brainstorm Health conference in San Diego. But their discussion was also about wallets—specifically, in what technologies these investors are putting their money. Legendary Silicon Valley investor Beth Seidenberg of Westlake Village BioPartners made news at the conference, revealing that cell therapy startup Tmunity has brought a product into human clinical trials that has knocked out multiple cancer genes. The reveal came during a back-and-forth when the moderator, Fortune executive editor Adam Lashinsky, asked participants to weigh in on the impact of Amazon in health care. The e-commerce giant is a hot topic even at a conference focused on medical technology, since its entrance into the pharma space with its acquisition of PillPack and foray into nonprofit healthcare, along with Berkshire Hathaway and JPMorgan through Haven. A good example of this is PillPack, which has allowed the company to get comfortable with the federal regulatory and HIPAA framework. She expects Amazon’s next move will be to start monetizing medical devices. But breakthroughs like Tmunity’s are also impossible to ignore. For more coverage of Fortune’s Brainstorm Health conference, click here. For news delivered daily to your inbox, subscribe to Fortune’s Brainstorm Health Daily newsletter.